This performance sought to generate dialogue on the situation in Israel-Palestine. 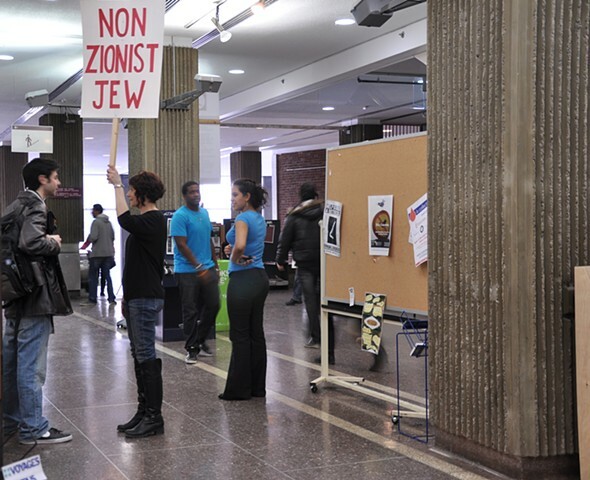 Over the years, the university administration has limited and even banned events and kiosks in the Hall building in an effort to halt confrontation between students. These tactics do nothing to ease tensions or to stimulate dialogue and discussion. With this performance I was hoping to engage individual students in discussion on Israel and Palestine. Here I am having a very heated discussion with a student expressing very pro-Israeli state views. We did not agree with each other at all... but at least we were having a conversation.